Satanists in Perth. Panthers in Sydney. Inner Melbourne Secret Morgue. Australia is stuffed full of stories that need to be taken with a big spoonful of salt. Stories that we all know are silly, but that we also love to share. In Great Australian Urban Legends, Eamon Evans presents myths, misconceptions and bare-faced lies about real people and real places down under. These pages libel Captain Cook and slander Phar Lap. They will annoy the Wiggles and David Boon. They will reveal whether Harold Holt really died, if the bunyip ever lived, and which famous Australian now gets by as a ghost. 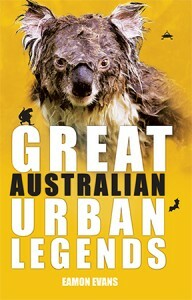 With Nearly two hundred myths, told with equal measures of wickedness and wit, Great Australian Urban Legends is a book for anyone who loves a tall tale.